Wintech International lightweight elite model coxless four/quad. Kevlar/carbon-laminated, full honeycomb core shell with press molded carbon seats. 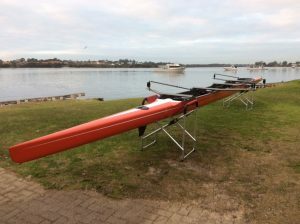 Quick-release brushed aluminium wing riggers (sweep and scull), two foot-steering plates for any seat, Nike rowing shoes. Boat weight 51kg for 60-80kg crew weight. Shellcovers boat cover, and Wintech rigger covers for sweep and scull riggers. Completed in mid-July 2013, arrived in Perth in late October of that year, has been meticulously maintained and sparingly used and is in excellent condition. Seeking expressions of interest in the region of $20,000, representing an annual depreciation of 10% on the purchase price of $30,000. Contact: Lorraine Ironside, email iidoc@iinet.net.au; phone mobile 04488 435453; landline (08) 9386 3937.